Yay! Fall is here. I love it plus its gorgeous out. Edmonton Expo is next weekend and new shows are starting! My sister was out and look how big my nephews are getting. 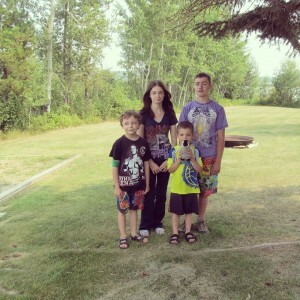 Here is a pic of my sister and my nephews. They are! They are all 4 years apart. The oldest is 13, the middle one is 9 and the youngest with the penguin will be 5.